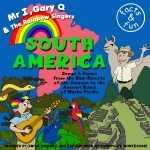 Vivid, colorful songs about parrots, llamas, alpacas, the two-toed sloth, the rain forest and the mighty Amazon. Some songs are in Spanish. A song that teaches the names of all the countries as well. SOUTH AMERICAN COUNTRIES - Lists all the country names in song. Easy to memorize. LLAMAS & ALPACAS - A fun song about these members of the camel family. TWO - TOED SLOTH - Upside down song about the sloth. PLANTS & ANIMALS - How plants and animals depend upon each other for survival in the rain forest. SAMBALALE - Brazilian folk song. Silly Sambalele, always getting into trouble. HUMMINGBIRD - Can there be a more fascinating bird? FIVE BIG PARROTS - Fingerplay about parrots and a jaguar. See the bottom of this page for a free copy of this poem. PARROT SONG - Facts on the four types of parrots in South America. MI CHACRA (MY FARM) - Farm animals in Spanish. Based on a folk melody from Argentina. CHACARERA - Folk song from Argentina. SAN SERENI - Folk dance in Spanish. Children can act out each of the parts. SPANISH COUNTING SONG - Count to ten in Spanish. Learn to say Hello and Goodbye. AMAZON - Beautiful song about this powerful and important river. RAIN FOREST SONG - A day in the life of the rain forest. We can help protect this balance. Tracks 18 to 27 are the SINGALONG tracks. Empty tracks with the music. Once the children have learned the words they can sing along themselves. Five big parrots perched on a tree Flapping their wings happily One saw a jaguar on the forest floor It flew away, and then there were four. Four big parrots perched on a tree. Flapping their wings happily . One saw the jaguar climbing up the tree. So it flew away, and then there were three. Three big parrots, perched on a tree. Flapping their wings happily. The jaguar kept creeping through the understory too. One parrot flew away, and then there were two. Two big parrots perched on a tree. Flapping their wings happily. The jaguar reached the canopy up close to the sun. One parrot flew away, and then there was one. One big parrot perched on a tree. Flapping its wings up in the canopy. The jaguar leapt through the air with a great big pounce. but the parrot flew away. I wonder? Do jaguars bounce? Take a trip around Africa meeting animals, tribes and visiting exotic places! Funny and Fun! Contains information about the culture of Ancient Egypt, the geography, animals, birds, plants, fish, the history and so much more. Songs and poems about penguins, seals, the food chain, icebergs and science stations. Lots to learn about Antarctica. A fabulous collection of traditional and original songs and poems from and about the magnificent continent of ASIA. Great songs about the land, the history, the animals, the plants, and the people of Australia. From the shores of the Mediterranean to the top of the Matterhorn. Learn many interesting facts about the countries in Europe as you sing along with Mr. I and the children. Another wonderful and exciting way to learn interesting facts about countries of the world. Teacher Guide filled with ideas for teaching geography are downloadable from the enhanced CD or DVD.